I feel like every time I talk about Mr. Man and his education, I am telling you about how he is a hands on learner, and needs multi-sensory curriculum. I’ve been seeking out programs that work with his naturally wiggly nature. I am so happy to tell you I have found a program that fits him perfectly, TouchMath’s Kindergarten program. What do you get when you purchase TouchMath Kindergarten Curriculum? 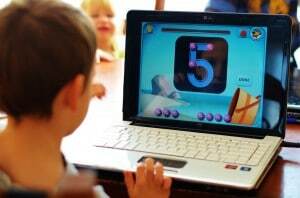 Each grade level of TouchMath’s Homeschool Program is comprised of 4 Units. Each unit has 6 modules, each with an assessment, and 90 activity sheets for the child to complete. The Units downloads contain the teacher’s guide and student pages. Even at the kindergarten level, word problems and math vocabulary are incorporated right into the lesson. Lessons also include “real world connections” like science facts about animals and other topics of interest to kindergarteners, which makes math more fun and relatable to a young child. The teacher’s guide contains an overview of the content in the module, as well as information on the Common Core Standards and how the module meets (and, often exceeds) them. Vocabulary, a materials list, and additional activities to do outside of the workbook pages are also included. The best part of the teacher’s guide is the information and guidance given for every worksheet the child is to complete. Sample dialogue is included, as well as real world connection information and tips to engage learners at all ability levels. These are not required to use the program, but are highly recommended. I go into detail about my favorite TouchMath manipulatives and how they worked in our home below. How did it work in your home? We received the complete Kindergarten Units A-D, TouchShapes, 3-D Numerals, and the TouchMath Tutor Kindergarten Software to use with Mr. Man. He is almost 5 years old, and before starting this program had very little math exposure other than counting and an understanding of one-to-one correspondence. Setting up the program to use took a little time. When I received the downloadable curriculum, I was a little overwhelmed at the sheer quantity of materials. There are over 200 pages for each unit, all in one file, which kept my printer busy! The only thing I see room for improvement on with this program is the way the file is offered. It took a little time for me to sort through the large file to separate the student pages from the teacher pages. I wanted to print them off two sided and bind them separately which was difficult the way the file is formatted. 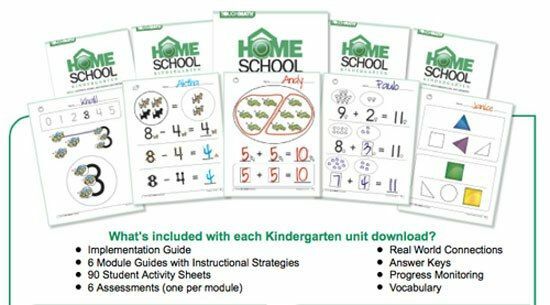 It would be nice for there to be two separate files, one of the teacher pages and one for the student in the homeschool download, as well as an option to purchase a hard copy instead of printing your own material. Once I had the pages printed off and ready to go, the program was easy to learn to use. I love programs that are “open and go.” This program is laid out nicely. In the teacher’s guide, there is a small image of every single student page, so it’s easy for me to keep track of which page we are working on and how to teach it. I do feel like you really *need* the teacher information. It was helpful to have the book open next to me while I sat on the floor teaching Mr. Man. The workbook pages are deceptively simple, but when you add in the information and follow all the directions on the teacher’s pages, you cover a lot of information without overwhelming the child with busy workbook pages. This program progresses gently, without overwhelming the child. It starts with the very basics of identifying numerals, counting, and working up to addition and subtraction. I feel like it is a true kindergarten level and is right on target for children just starting their education. Mr. Man is distracted by busy pages and gets overwhelmed easily, but TouchMath is set up perfectly for children who need simple, clean pages. Mr. Man LOVED the TouchShapes we used with the program. 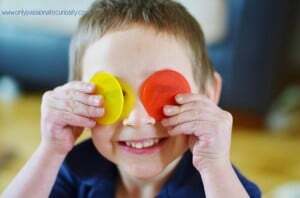 They are made of thin, translucent plastic, but are sturdy for little hands. These are really neat because they are sized to fit right on top of the shapes in the workbook. He loved fitting them in their places like a puzzle. On some of the pages, this also meant he didn’t need to write, because he was able to answer the question by building it with the shapes instead of picking up a pencil. If you were only going to purchase ONE manipulative to go with the TouchMath program, this is the one I would recommend. We have used them daily with every lesson we do. The 3D numerals are also huge hit with both of the little kids in my house. Mr. Man learned the “touch points” quickly (the counting pattern associated with each letter) and I was amazed at how it helped him remember the quantity associated with each numeral. Miss Em loves the letters too- they are so brightly colored, and are made out of thick plastic. They are sturdy enough to be toted around even by toddlers. We used them to practice touch points, and to practice numerical order. When we begin addition and subtraction 0-9, I know they will be incredibly helpful! Any of the manipulatives with the Touch Points could be used for these purposes; if you were able to get any one of these manipulatives to use with the program, I would: 3-D Numerals, TouchPoint Posters, and/or the Texture Cards. The TouchMath Tutor Software was also really helpful. This allowed Mr. Man to have extra practice with the Touch Points and other topics. I liked that he was able to expand on his lessons independently, which gave me more time to work with the other kids. We were able to double our time spent on Math daily with this program. Mr. Man calls it his “game” and plays on it willingly. I like that it provides gentle instruction, for example, if he gets an answer wrong, the game simply says “try again!” and gives him more time to work out the answer. I have been using TouchMath’s Kindergarten program daily with Mr. Man for over a month now, for about 20 minutes a day, plus computer time. I am blown away with how much he has learned, and how much he loves this program. I feel like all the materials we used from TouchMath were high quality, and served important purposes. I plan on continuing to use this program this year, and am strongly considering purchasing the next level when we are finished with Kindergarten if I can work it into our homeschool budget. I highly recommend TouchMath. This program would work great for children who need hands-on instruction, parents who enjoy “open and go” programs, and children with special needs. TouchMath Kindergarten is appropriate for children who do not yet read or write fluently, and have little to no previous Math education. 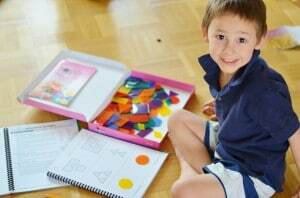 TouchMath has homeschool curriculum for Preschool, Kindergarten, First and Second grade. The Schoolhouse Review crew has families reviewing all of these levels, so head on over to the Crew Blog to hear more about this amazing program and the different grade levels. Hi Heather. We are thrilled that you and Mr. Man enjoyed the program, and are always happy to hear and see ways in which TouchMath positively impacts students! Thank you for the informative write-up and wonderful photos of the program in use in your home. Please let us know if we can be of assistance in the future. Thank YOU TouchMath for the opportunity to discover this program. I really think we’ll be sticking with it for Mr. Man as long as we can. It’s been a wonderful introduction to Math. He loves it, and I love seeing him enjoy learning!